Apply full strength to fabric. Let soak, rub lightly, rinse clean. Dab full strength on wall, and wipe off with moist sponge. Apply full strength to fabric. Let soak, then pull gum off. Dilute 5 drops in 1 quart of water. Use in windshield reservoir. Dilute 2 tbsp. in bucket of hot water. Apply with sponge, let soak, lift off. Add 1 tbsp. to 1/2 gallon of water. Soak 24 hours, rinse with hot water. 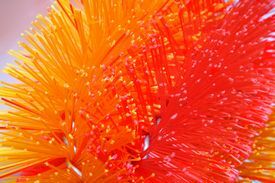 * Always spot test first for colorfastness, especially on nylon, acetate, silk, or washable wool, before widespread use. If color doesn't bleed or fade, proceed with recommended use. The statements made on this site have not been evaluated by the Food and Drug Administration. Rather the statements made are what some folks have experienced personally. Copyright 2015 Cindy McAsey - Barefoot in the Garden. Picture Window theme. Theme images by Nikada. Powered by Blogger.